Roberto Díaz was born in Havana city on January the 29th, 1971. Since his early years, he was interested in music and arts. His father helped him, since he was a little boy, to know the world of classic music, movie soundtracks and also instrumental and other varieties of creative compositions. He began to study guitar when he was 9 with a teacher who was paid by his parents. Nonetheless, after a while he decided not to continue the lessons with this teacher. When he became a teenager, he was into the The Beatles, Led Zeppelin, Deep Purple, Queen and other rocks bands. Since this moment on, he turned to be an enthusiastic about rock and it drove him back to take guitar lessons. This time he chose to do it auto didactically, mostly directed to learn the tricks and secrets of rock and blues. At that time he used to play and to sing with a group of friends in a local rock band, and by these years they founded one of his own which was devoted to play covers. The name of this band was Oda and it helped Roberto to appear live for the very first time. Due to the influence of the psychedelic rock of late sixties –The Beatles, Pink Floyd, Procol Harum…-, in 1989, he decided to follow this branch and created the band Grieta Solar Subterránea (Subterranean Solar Crack), with which he began using own compositions. That year, he started his major in Musical Education and classical guitar, and dedicated all his time to this. Then, he discovered the magical music of Pink Floyd, Yes, Rick Wakeman, Emerson Lake and Palmer, King Crimson and Genesis, which changed his orientation from that moment on. The gestation of a progressive rock band grew in his head. He finished his major in 1994 and two years later his dream came true on account of the founding of Anima Mundi with a group of school friends. With Anima Mundi, Roberto played the guitar and composed as a real gifted. The “Mundis” were very rapidly breaking through the Cuban alternative musical panorama and the formation was regarded as one of the most prestigious bands in the island. Due to a fruitful musical creation, Anima Mundi recorded the demos Eterno Cauce (1997), Tierra Invisible (1998), and Más Allá (1999) and the albums Septentrión (2002), Jagannath Orbit (2008), The Way (2010), Live in Europe (2012), The Lamplighter (2013), I Me Myself (2016). In Roberto’s musical experience, “Anima Mundi is like a bridge that reaches far beyond”. 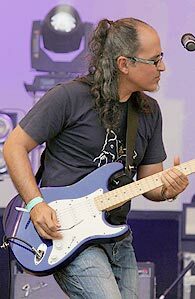 As a guitar player, Roberto has also collaborated in very active way with other artists, bands and projects along his career not only in studio but also live. Among these collaboration we can quote: Raúl Ciro, albums Ciro 3C (1998) and Queso (1999), Miguel Ulises, album Trampas de la Belleza (1999), Tesis de Menta, two first demos plus live (2004-2005), Los Kents, live (2006 2008), Sunchild, album As far As the Eye can See (2011), Karfagen, album Lost Symphony (2012), Mangrove especial guest live (2012), Gens, live (2015), Vieja Escuela, live (2016). Occasionally, he has shared stages and recording sessions with other artist and bands. He was also a member of the Anima Mundi musicians’ collateral project Nimbo. Anaisy Gómez, Virginia Peraza and Roberto fused the Celtic, Symphonic, New Age and rock in this trio band which was followed by a great amount of people all along the island. Nimbo recorded an EP entitled Sobre las Brumas (2005). He has also composed and played music for television; his best known works are: Coordenadas, Secuencias, Dando la Nota, Guanhacabibes, La Noche de los Libros, Noticiero Buenos Días and Noticiero de Cine Latinoamericano. Roberto has sometimes worked as musical producer as well. Apart from being a musician on stage and in the studio, he has also been a guitar professor from 1995 until today. He was the head of the Guitar Class in Instituto Superior Pedagógico Enrique José Varona of Havana city and a guitar professor since 2000 to 2010 in the I.S.H International School of Havana and a private professor for several guitars players in Cuba. His vocation for lyricist is also remarkable in his path as an artist. He has had ideas, created concepts and written several lyrics in which he uses his own and significant style. His sound on guitars is also recognizable among audiences: spacy and imaginative, dreaming and atmospheric, sometimes heavy and dark, other times glowing and ethereal with the use of different kinds of delays, reverbs and modulators. The use of expression pedals like wah, volume slow gate effect and whammy are also characteristics of his sound, as well as a wide variety of fuzz boxes and overdrives.